274 pages | 18 B/W Illus. Frontiers are "wild." The frontier is a zone of interaction between distinct polities, peoples, languages, ecosystems and economies, but how do these frontier spaces develop? If the frontier is shaped by the policing of borders by the modern-nation state, then what kind of zones, regions or cultural areas are created around borders? 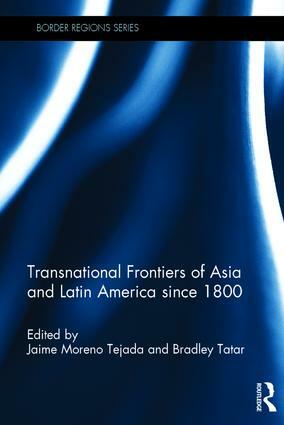 This book provides 16 different case studies of frontiers in Asia and Latin America by interdisciplinary scholars, charting the first steps toward a transnational and transcontinental history of social development in the borderlands of two continents. Transnationalism provides a shared focus for the contributions, drawing upon diverse theoretical perspectives to examine the place-making projects of nation states. Through the lenses of different scales and time frames, the contributors examine the social processes of frontier life, and how the frontiers have been created through the exertions of nation-states to control marginal or borderland peoples. The most significant cases of industrialization, resource extraction and colonization projects in Asia and Latin America are examined in this book reveal the incompleteness of frontiers as modernist spatial projects, but also their creativity - as sources of new social patterns, new human adaptations, and new cultural outlooks and ways of confronting power and privilege. The incompleteness of frontiers does not detract from their power to move ideas, peoples and practices across borders both territorial and conceptual. In bringing together Asian and Latin American cases of frontier-making, this book points toward a comparativist and cosmopolitan approach in the study of statecraft and modernity. For scholars of Latin America and/or Asia, it brings together historical themes and geographic foci, providing studies accessible to researchers in anthropology, geography, history, politics, cultural studies and other fields of the human sciences. Jaime Moreno Tejada is a historical geographer based at Chulalongkorn University, Thailand. Bradley Tatar is a cultural anthropologist based at UNIST, Ulsan, Korea. Click here to download the introduction.